An article on the Zionist origins and politics of the Atzmon current in the Palestine solidarity movement. See my post 'Israel's royal welcome' on the Guardian's Comment is Free site. The Jewish National Fund was formed in 1901 to 'redeem' the land of Palestine as the inalienable property of the Jewish people. In other words to ensure that when the land was purchased, it was used solely for the benefit of Jewish people, who were the only ones allowed to live their or work the land. As a matter of course, Palestinian labourers and peasants were evicted from the land. In 1950 the JNF who had managed to purchase about 1/2m dunums (1/4 acre) uptill then, were sold, at knock-down prices, another 2m dunums from which the Palestinian population had been expelled. Why, one might ask, should the newly formed Israeli state have any need to sell anything to the JNF? The answer is quite simple. The Israeli State does not wish to be seen openly to discriminate against non-Jews. It therefore subcontracts that to organisations which are openly racist in their practices, like the JNF. And to make sure the 1953 JNF Law ensured that the Israeli State had to approve the JNF's Memorandum of Association as it was formally incorporated. In 1960 the Knesset passed a Law establishing a Covenant between the State and the JNF, formally signed in 1961. 3 Land Laws in 1960 established an overall Committee to dispose of the 80% of land that belongs to the State and the 13% belonging to the JNF. To this day 93% of Israeli land has been designated for the use of Jews only. The JNF therefore reacted furiously to the recent Supreme Court decision in the Ka'adan case which stipulated that all land over which the State has control must be allocated without regard to ethnic or national considerationis. For the first time since the State of Israel was founded, the High Court of Justice has been required to consider petitions that de-legitimize the Jewish People’s continued ownership of KKL-JNF lands. These petitions are, in fact, directed against the fundamental principles on which KKL-JNF was founded and in accordance with which it has acquired land and managed it for the past hundred years, up to the present day. The petitions constitute a demand to deprive KKL-JNF – which serves as trustee for the lands of the Jewish People – of the right to make use of these lands for the continuation of the Zionist enterprise in the Land of Israel. None of this has stopped Gordon Brown becoming a patron of the JNF or Prince Phillip from hosting a dinner on 7th April at Windsor Castle in 'celebration' of 60 years of genocide, expulsion and massacre of the Palestinians (sorry 'independence'). So it's fine to host an openly racist organisation because the proceeds are apparently going to a charity which 'plays a significant part in attempting to bridge the gap between young people of all faiths and backgrounds'. Well that makes it ok then. Next time the SS Veterans Organisation holds a commemoration let's just hope they choose the right charity to benefit from it!! Justices Mazza, Beinish and Joubran rejected the residential community’s objection to the decision by the Israel Lands Authority to allocate a plot of land to the Arab family. During the hearing, that took place last Thursday, Justice Eliahu Mazza levied clear criticism on admissions committees in residential communities, such as that of Katzir, and on the way they make their decisions. Among other issues, he noted that that “today the committee demands a graphology test, tomorrow they could require observation in a psychiatric hospital.” In response to a request by Attorney Dan Yakir, ACRI’s Chief Legal Counsel, who represented the Ka’adan family, the petition remains pending until the purchase contract between the Israel Lands Authority and the Ka’adan family has been signed. By way of background, in 1995 Adel and Iman Ka’adan first applied to buy a plot of land and build their home in the Katzir community. After the authorities denied the request, ACRI submitted a petition on their behalf to the Supreme Court. The court ruled in March 2000 that the state is not authorized, according to law, to allocate state land to the Jewish Agency for the purpose of establishing the Katzir communal settlement based on a discriminatory policy that differentiates between those who are Jews and those who are not Jews. During the years following the court ruling, the various authorities (The Israel Lands Authority, The Jewish Agency, and the residential community of Katzir) have done their utmost to block implementation of the judgment and wear down the couple to the point that they will eventually just give up, while attacking the couple’s character. As a result, ACRI submitted an additional petition on behalf of the family to demand that the state agencies implement the court’s ruling. In response to the second petition, the court issued an interim injunction ordering the reservation of a plot of land on the western hill of the residential community where the family originally wanted to build their home, until the summation of the hearing on the second petition. In May 2004, the Israel Lands Authority informed the Supreme Court of its intention to allocate a plot to the family at the price stipulated in April 1995, the date the family first submitted their request to build a home in the community. The battle did not end there however, and the Supreme Court rejected the Katzir community’s subsequent objection on Thursday. In recent weeks there has been little else on Mary Rizzo's Peacepalestine blog but a Petition in Support of 2 Outstanding Personalities (Atzmon & Rizzo!). The fact that some 200 odballs have signed a petition in support of racists and anti-Semites is considered more newsworthy than the siege of Gaza for example. However I've maligned the signatories it seems. The following appeared on Alef, the Academic Left mailing list, from Shraga Elam, an anti-Zionist Israeli historian living in Switzerland. I learned from Ellen Rohlfs and from Hajo Meyer that they did not sign the petition. Hajo is even very insulted that I could believe that he would sign such a petition. Obviously somebody did it unauthorized on their behalf and Mary can find it out as she has the IP of the sender/s of the supporting mails. I don’t blame Mary for the fake, although by most of the petitions that I initiated being aware of such problems, we demanded a confirmation of the signature. However people should rest assured. The signatories of Holocaust deniers like Paul Eisen and Wendy Campbell and The Radical Press are genuine, as are the signatories of conspiracy nuts like Jeff Blankfort and the zany academic Oren Ben-Dorr. 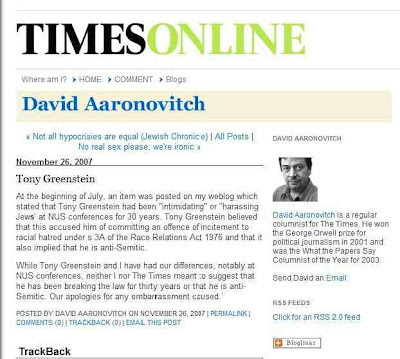 Last year I brought libel proceedings against The Times because David Aaronovitch had deliberately allowed, on his moderated blog, allegations that I had intimidated and harassed Jewish students for 30 years. The Times eventually backed down and agreed a suitable apology and damages of £1,000 to be paid to FOBZU. Unfortunately I have again had to seek redress for defamation. On February 13th 2008 I initiated proceedings in the High Court for libel and defamation against Gilad Atzmon, who will be well known to many people as an anti-Semite and a supporter of holocaust denial. Following an article I wrote for the Guardian’s Comment is Free blog, The Seamy Side of Solidarity, I was subject to malicious personal abuse by Atzmon, mainly picking up on stale Zionist allegations, although adding his own unique spice to them. It is not simply a matter of obtaining personal redress. There is also a political rationale. Socialists have long disagreed over whether it is right to settle political disputes in the libel courts and the record is clearly a mixed one, for example George Galloway and Tommy Sheridan’s experiences. Atzmon’s response to political criticism is not to respond politically but by making vicious personal allegations against his detractors. He has done this against Mike Rosen, Roland Rance and David Rosenberg to name but 3 people. His behaviour is designed to ridicule, intimidate and isolate his critics and in particular Jewish anti-Zionists or what he terms ‘crypto Zionists and 3rd Category Jews’. Most of his allegations originate on far-right Kahanist sites and he actually thanks one of these Zionists publicly. Some of Atzmon’s allegations could endanger the physical security of those whom he is making the allegations about. In particular his allegations that anti-Zionist Jews are in essence nothing but Zionist agents within the Palestine solidarity movement. But above all it is designed to demonise individuals and legitimise racism in the solidarity movement. I have therefore come to the conclusion, as the primary recipient of his abuse, that there is little alternative but to use the bourgeois courts to seek redress. Ironically on 9th June 2005 Atzmon threatened to sue me for libel before making a hasty retreat! Mr. Greenstine I don't wish to sue you, i sue you and the following on line quote ( Re: The talk of Holocaust Denier, Gilad Atzmon, ) is going to cost you a fortune. I ve already passed it to my management and its legal advisers. To call a famous artist a 'Holocaust denier' without providing a single proof is very expensive as you are going to learn very soon. I understand, from a posting by Linda Grant on the Engage website, before it was ‘accidentally’ deleted, that Atzmon is considering countersuing for libel! Judging from his past record however this is likely to be more bluster on his part. I saw Gilad Atzmon in the lobby at the BBC last week. We were both waiting to go into studios. He was talking at some length to someone on his mobile phone about the best method of suing someone, based on the case he is himself, he said, preparing again 'Greenstein.' He was dressed all in black and I was left with the impression that he dyes his hair. Personally, I find that iffy in a guy, but very common in the music business, I suppose. False allegations of serious criminal conduct and fraud. concerning alleged offences over 20 years ago, contrary to s.8 of the Rehabilitation of Offenders Act 1974. For obvious reasons I do not wish to go into any detail regarding the legalities of the case. However in view of the fact that this matter has already been broadcast by Atzmon’s supporters under various guises (‘Jews for Transparency’ being one), I thought it right to issue a statement. AN INTERNATIONAL CALL FOR THE IMMEDIATE RELEASE OF DR. GASSAN SHARIF HALED WHO WAS ABDUCTED BY THE ISRAELI OCCUPATION ARMY ON 16/01/08 !!! "We are friends and supporters of Dr. Gassan Sharif Haled’s family for the past five years, both from Israel and from the international community. Some of us are also frequent visitors of Gassan’s parent’s home in the West Bank village of Ja’ayus. We ask you to sign this petition to demand the immediate release from prison of our dear friend, who holds a Ph.D. in law and is a respected professor of international law at Al-Jajah University in Nablus. We can wholeheartedly attest that the members of this family are moderates and genuine peace seekers; they respect all humanity and are sincere adherents of the path of non-violence. We are blessed to be befriended by this noble family. Dr. G. Haled was to be promoted in the near future to assistant-professorship at the Law Faculty of A-Najah University. Dr. G. Haled is an expert in International Commercial Law; he supervises 17 students in graduate programs and lectures in front of hundreds and is highly respected by the students as a teacher. In addition, Dr. Haled holds the position as the university’s arbitrator in internal matters, and we suspect that an unhappy grievant in one such case may have been the source of the allegations against Dr. Haled. His abduction by the Israeli Secret Service has damaged not only Dr. G. Haled and his close family, but also the academic programs at the law school, where the academic routine is already hampered by arbitrary constraints regularly imposed by the Occupation. Since his arrest, Dr. G. Haled has been subjected to severe and humiliating interrogation by the Secret Service. Immediately following his abduction, he was chained to a chair for 21 continuous hours each day for six days running. For three weeks following his arrest nothing was known of his whereabouts or about the “formal” pretext for his disappearance; only then was his attorney granted access to him. His detention has been extended every 8 days since. The suspicions against Dr. G. Haled seem to us ridiculous if not impossible: we will not be surprised to discover soon that the Secret Service has merely succumbed to baseless rumors. Not once this had “happened” before, when this respectable institution sufficed itself with little more than scant gossip for critically disrupting the lives of his “suspects”. Two days ago (27/2/2008) eight of us were present at the military court when Gassan’s detention was extended for nine additional days. The physical and mental hardships to which he has been subjected were evident in his appearance, in particular his notably bent torso. Towards the end of the hearing he asked the judge for the permission to speak briefly. Though permission was granted, when Gassan stood up, he was unable to utter a word as was choked with tears, evidently overwhelmed by his humiliations. When several minutes later he regained composure, he recounted the details of what he was repeatedly questioned about in the 45 days since his arrest: several SMS and email messages between unrelated third parties which the Shabak (Secret Service) had picked up and which suggested that Dr. Haled is an active Hammas member. Dr. Haled maintained that he had not the slightest idea about the source or the motives of those behind the baseless allegations. Consequently, we do not rule out the possibility that the basic motive for this demonstration of evil originates from a wider scope - crippling the pedestals of the Palestinian society, which is attempting to survive and develop against all stakes. PLEASE JOIN US in demanding that the Israeli military release Dr. G. Haled from the Secret Service’s prison; Israel's security will not be compromised, and Dr. G. Haled and his family will be spared further suffering and injustice! FREE DR. GASSAN SHARIF HALED !!! " When Matan Vilnai, Israeli deputy Defence, or more accurately War Minister, promised a 'shoah' for the Palestinians of Gaza, we can assume that he chose his words with care. The Holocaust is a metaphor for many things in Israel and the treatment of the Palestinians is no exception. Nor is this the first such instance. In the 1980's a group of soldiers within the Golani Brigade called themselves the Mengele Squad. When secular Jews have retaliated against Orthodox Jews they haven't hesitated to daub the walls of synagogues with swastikas and the incidents last year where gangs of neo-Nazis were targetting migrant workers, the elderly and graveyards, is indicative of the truth behind whether Vilnai only meant a 'disaster' as is being alleged. Israeli military air strikes and artillery attacks on the Gaza Strip during the last few days have killed over 100 Palestinians, including dozens of children and other civilian bystanders. Three Israelis â€“ a civilian killed by a rocket fired by a Palestinian armed group on 27 February and two soldiers â€“ were also killed. Many of the Palestinians killed were militants involved in attacks on Israel, but others were unarmed civilians taking no part in the hostilities, including some 25 children. The precise number of civilians killed is unclear and difficult to establish. The Israeli chief of staff is reported to have claimed that 90 percent of those killed were militants, but the UN and other sources, including those in Gaza, suggest that as many as half of the dead were civilians. More than 250 other people, including scores of unarmed civilians, have been injured. Israeli forces also destroyed houses and property across the Gaza Strip, including at least two medical facilities, before withdrawing on 3 March. Amnesty International said on Sunday that the Israeli military air strikes and artillery attacks on the Gaza Strip were being carried out with reckless disregard for civilian life, and called on Israel to put an immediate end to such disproportionate and reckless attacks. This latest cycle of killings and destruction comes at a time when the 1.5 million inhabitants of Gaza are confronting a humanitarian crisis as a result of the increasingly stringent blockade imposed by Israel on Gaza. Hospitals and medical facilities, already facing severe difficulties in coping with shortages of electricity, fuel, equipment and spare parts due to the Israeli blockade, are struggling to cope with the new influx of casualties caused by Israeli attacks in the last few days. With Gaza`s borders sealed, many patients in dire need of medical care that is not available in Gaza cannot be transferred to hospitals abroad and risk losing their lives. In the past two months, Israeli forces have killed more than 230 Palestinians in Gaza, including scores of unarmed civilians, and wounded and maimed many others. During the same period, Palestinian armed groups have continued to fire qassam and other rockets indiscriminately at Israel from the Gaza Strip, mostly towards the town of Sderot but also, last week, the more distant town of Ashkelon. One Israeli civilian has been killed and several injured by such rockets fired from Gaza into Sderot and other areas by Palestinian armed groups. Amnesty International has again called on Hamas and the Palestinian Authority to ensure that Palestinian armed groups cease immediately from carrying out indiscriminate attacks against Israel, and for those responsible to be held to account. `It is high time that the leaders of Hamas and the Palestinian Authority (PA) took effective steps to prevent and punish attacks on civilians in Israel,` said Malcolm Smart, `but their failure to do so does not make it legitimate for the Israeli authorities to launch reckless air and artillery strikes which wreak such death and destruction among Palestinian civilians. Documents that appear to show that the US attempted to overthrow the Hamas-led Palestinian government have surfaced. One of the documents from March 2007 details a plan to oust Hamas by force and instal the rival Fatah movement in power, by supporting fighters from the group with weapons and money. In Cairo, Condoleezza Rice, the US secretary of state, said she had not read the report which appeared in Vanity Fair magazine. However, she justified the arming of Fatah, saying the situation called for it. `It is very clear that Hamas is being armed. And it is very clear that they are being armed in part by the Iranians,` she said on Tuesday. Evidence showing the US sought to remove Hamas in a coup dates back to 2006, after the group had come to power through Palestinian elections. The memo was not labelled with official US stamps or seals. However, Mahmoud Abbas, the Palestinian president, did not follow the plan. Rather he formed a unity government with Hamas in early 2007 after continued fighting between the rival factions in the Gaza Strip. This failure by the US appears to have led to the second document and the plan to oust Hamas by force. It appears that the US sought to bolster Mohammed Dahlan, the head of Fatah`s security forces. Yet, this too failed as inter-faction fighting broke out in the Gaza Strip and Hamas took control. Evidence suggests that Hamas was forced to act in order to pre-empt the US plot. Fatah security forces were trained in Jordan and Egypt, from where they are sent to work in the Gaza Strip. Nour Odeh, Al Jazeera`s correspondent in Ramallah, said that many Palestinians would be upset that Fatah appeared to have played into the hands of an American foreign policy that wanted to make an example out of Hamas, whom the US labels a `terrorist` organisation. There has been no official response from Abbas. Students at the Max Stern Academic College of Emek Yezreel are up in arms after a lecturer allowed a minute of silence to be observed for the Palestinian casualties in Gaza. During an education consulting class for master`s degree students on Monday, an Arab student stood up and asked senior lecturer Dr. Osnat Dor for permission to speak. `What`s going on in Gaza really hurts me. It hurts me that people are ignoring this ongoing event, it hurts me that they`re killing children in Gaza and I want to hold a minute of silence to remember all the dead,` the student said. Dr. Dor told her that she understood her emotional torment but also underscored the suffering that children in Sderot, Ashkelon and other Gaza vicinity communities have been undergoing recently. The student called on all the students in the class to join in and hold a minute of silence and 'Jews and Arabs alike' stood up in the class for a whole minute. Afterwards, they held a joint discussion on the goings-on in the Strip. At the end of the class, rumors began spreading about the event and some students were furious. Dr. Dor said in response that `Sderot`s pain is my pain. I wouldn`t allow students in my class to only identify with the remembrance of Palestinian children. I immediately put the student that committed this provocation in her place and made it clear to her that Jewish students wouldn`t identify with her. Tuesday afternoon, the Student`s Union is set to go on strike and hold a rally in support of Sderot and Gaza vicinity residents. In the winter of 1991, Saddam Hussein bombed Tel Aviv. For a month and a half, long-range missiles landed on the city. People panicked and many fled to Jerusalem, while the leaders issued pompous statements about the terrible blow the Iraqi dictator was about to receive. But nothing happened. We did nothing. In February-March 1996, buses exploded in Tel Aviv and Jerusalem and dozens of people were killed in suicide bombings in the streets and restaurants. People who went to the grocery store did not know if they would return. Those who went to a restaurant or disco were seen as risking their lives. Shimon Peres, who was then prime minister, realized that the suicide attacks would destroy him politically but could do nothing to prevent them. Sure enough, Benjamin Netanyahu won the elections. In 2001-2003, terror struck in the heart of Israel again. The suicide bombings emptied the shopping centers, tourism halted, businesspeople went bankrupt and received no compensation. The economy plunged into a deep recession amid rising unemployment. Even then we did not enter an all-out war in the Gaza Strip and West Bank. So it is wrong to argue that the state has abandoned Sderot and the western Negev. If this is abandonment, then Tel Aviv and Jerusalem were abandoned as well. The truth is more prosaic: Power has limitations. The Israel Defense Forces cannot solve everything. Netanyahu may say there is a simple solution - `to move from attrition to the offensive` - but the reality is more complicated. The IDF acted on the outskirts of Gaza`s densely populated territory and two soldiers were killed. Had the army pushed deeper, the number of fatalities would have risen sharply. International pressure would have risen as well. The United Nations has already condemned us, Omar Suleiman, the Egyptian arbitrator, canceled his visit to Israel, and scenes from the beginning of the second intifada in October 2000 returned to the West Bank. The Qassam and Grad rockets continued falling even when the IDF was inside Gaza, and yesterday Hamas hastened to declare victory. Another irritating lie in the Israeli discourse insists that it is appropriate to make Gazans` lives a living hell, so that they will put pressure on their leaders and end the firing of rockets. This thesis was behind the first Lebanon war, but that fallacy didn`t work either, even when hundreds of thousands of Lebanese were forced to flee to the north. That was also the thesis behind the Second Lebanon War. But despite the Lebanese population`s extreme suffering, it didn`t work then either. It is certainly not working in Gaza. There things are horrifically bad. Poverty is awful, the number of fatalities is huge, the hospitals are collapsing from too many wounded, unemployment has reached the extraordinary level of 60 percent, and most of the population subsists on food provided by United Nations organizations. People in such a difficult situation have nothing left but their self-respect. In these days `all of Gaza has become Hamas,` a former Fatah security officer who is far from being a Hamas supporter, told Haaretz. Al Jazeera is broadcasting to every home the horror pictures of the deaths of dozens of children and women. In this situation, hatred triumphs and the only hope is the desire to take revenge. The rocket launchers are thus the heroes who gain the people`s sympathy, and support for Hamas is not getting any smaller - it`s growing. Indeed, signing an agreement with Hamas is risky. An agreement could weaken Palestinian President Mahmoud Abbas, whom Israel sees as a fitting partner. But it also harbors hope. We could make a cease-fire arrangement consisting of stopping the rocket fire in exchange for stopping the assassinations. We could agree on a prisoner exchange and bring Gilad Shalit home. We could even alleviate the economic siege in an agreement that would prevent transferring weapons and explosives via the Rafah crossing. All this is attainable, and is many times preferable to continuing the bloodbath, which would only raise the walls of hatred and revenge higher. Once we didn`t want to talk to the PLO and Arafat. Then we humiliated Abbas and didn`t want to give him any achievement during the disengagement. Now we don`t want to talk to Hamas. So the struggle will continue - until a catastrophe occurs, on their side or ours. Only then will the leaders be forced to sit down and talk around the negotiating table. Once again Israel defies an impotent international community which offers nothing but timid calls for ceasefire on "both sides." And once again Palestinian suffering and death tolls continue to break records in the territories occupied by Israel since 1967. Perhaps it is easy to dismiss this suffering by blaming the victims and resorting to ready cliches. Indeed, Israeli propagandists go out of their way to repeat the sound bite: we withdrew from Gaza in 2005 and since then the Palestinians have been firing rockets on our southern towns. This sound bite might fly in the western media; after all it resonates with a simplistic world view that ignites stereotypes which have been in the making for centuries, producing demonic and degrading representations of Muslims and Arabs. It becomes easy to describe the Palestinians in this context as the carriers of incomprehensible and irrational rage. This kind of representation has intensified since September 2001 with the "rediscovery" of Israel, and its supreme court, as a western lighthouse amid the darkness of the Middle East. When examined closely, however, reality rules out crude explanations of "violence without reason" and "terrorism without context." It becomes apparent that one cannot seriously discuss a legitimate resistance to a prolonged and horrendous military occupation within the context of the "war on terrorism." Moreover, even if one finds a place to critique some practices of the oppressed one should keep in mind the root of the problem: it is the occupation, not the resistance. No rhetorical device can conceal the reality of colonialism by transforming it either to a mere "conflict" between equally culpable sides or to portray the occupier as the retaliating victim. In his most recent report of January 2008, the UN rapporteur on the situation of human rights in the occupied territories has recounted Israel's actions in Gaza, calling them "war crimes" and demonstrating how these have been relentlessly producing a humanitarian crisis. Indeed, more than 80 percent of Gaza's Palestinians are living below the poverty line and depend on the food aid supplied by the UN agency for Palestinian refugees, UNRWA. In recent years Israel has destroyed power plants and other civilian facilities, reduced the fuel and electricity supply, and closed the borders. Palestinians' basic human needs, such as movement, food and medical treatment, became totally dependent on the whims of Israeli security technocrats and political demagogues. It was unsurprising then to witness on 23 January the overflow of tens of thousands of Palestinians to Egypt following the destruction of a part of the Gaza-Egypt border. By the so-called disengagement plan Israel has aimed to escape its responsibility for Gaza's fate while effectively remaining the occupier. It has also sought to impede Palestinian self-determination by separating the West Bank from Gaza and intensifying the colonization of the West Bank and East Jerusalem along with the vehement denial of the right of the Palestinian refugees to return to their homeland. One cannot expect the Palestinians to sit quietly while Israel is creating facts on the ground to transform and fragment the ever-shrinking Palestinian homeland making their aspirations as remote as they have ever been. One cannot expect the Palestinians to submit to their reduction from humans to mere beings concerned only with survival. Nimer Sultany is a Palestinian citizen of Israel and currently a doctoral candidate at Harvard Law School. He has worked as a human rights lawyer in the Association for Civil Rights in Israel and as the head of the political monitoring project at Mada al-Carmel (the Arab center for applied social research). This commentary was originally published by The Guardian's Comment is Free and is republished with the author's permission. Following Israeli Deputy Defense Minister Matan Vilnai's Friday warning that the Gaza Strip faces "a holocaust" if homemade rocket fire continues, Vilnai's aides rushed to downplay the remarks, claiming the minister did not mean a holocaust exactly. However, the following day, the Israeli army, through ground forces and helicopters in the sky, killed 61 Palestinians in Gaza, at least ten of them children. Since Wednesday, 26 March, Israeli occupation forces have killed at least 77 Palestinians in Gaza and injured approximately 130, including children who won't live to see their first birthday. Vilnai's racist declarations against the Palestinian people are certainly not the first from a high-ranking official in the allegedly democratic state of Israel. Last Thursday, 28 February, Israeli cabinet minister Meir Sheetrit said that the solution to the rocket fire would be for Israel to "hit everything that moves with weapons and ammunition." Earlier in the month, during a cabinet session Sheetrit stated that "exactly what I think the [Israeli army] should do [is] decide on a neighborhood in Gaza and level it." Genocidal statements calling for the ethnic cleansing of Palestinians are not reserved for those in Gaza, however. The extreme rightist Yisrael Beitenu party leader and former Deputy Defense Minister Avigdor Lieberman, who was born in Moldova and immigrated to Israel at the age of 20, advocates for the "transfer" or ethnic cleansing of indigenous Palestinian citizens in Israel and has declared that Palestinian members of the Israeli Knesset who meet with Palestinian leaders from the West Bank and Gaza should be executed as traitors. Before Lieberman was Rehavam Ze'evi, the assassinated Israeli tourism minister and founder of the fascist Moledet party which makes the ethnic cleansing of Palestinians part of its party platform. Regarding the 180,000 Palestinian laborers from the West Bank and Gaza working for substandard wages in Israel before the state imposed a total closure, Ze'evi described them in a 2001 radio interview as "a cancer" and advocated that "[Israel] should get rid of the ones who are not Israeli citizens the same way you get rid of lice." Dehumanizing the Palestinians has been necessary for Israel to justify its actions ever since, and even before, the state was declared on destroyed historic Palestine in 1948 and then in 1967 when Israel occupied the West Bank and Gaza. Taken together, they indicate the historic effort to destroy Palestinian national aspirations and this is what Israel is trying to do in Gaza, which Nobel prize winner and late Israeli Prime Minister Yitzhak Rabin once wished would be swallowed by the sea. Gaza is no stranger to devastation. In 1956, for example, former Israeli prime minister and war criminal Ariel Sharon moved troops under his command into the town of Khan Younis where a massacre was committed. Since the outbreak of the second intifada in 2000, Israel has been particularly cruel to Gaza, committing crime after crime without sanction from the so-called international communiy. The firing of homemade rockets -- no match to Israel's US-supplied and funded military arsenal -- came only after decades of violent Israeli oppression against Palestinians trying to shake off the military occupation. Rami Almeghari is currently contributor to several media outlets including Palestine Chronicle, IMEMC, The Electronic Intifada and Free Speech Radio News. Rami is also a former senior English translator at and editor in chief of the international press center of the Gaza-based Palestinian Information Service. He can be contacted at rami_almeghari at hotmail.com.